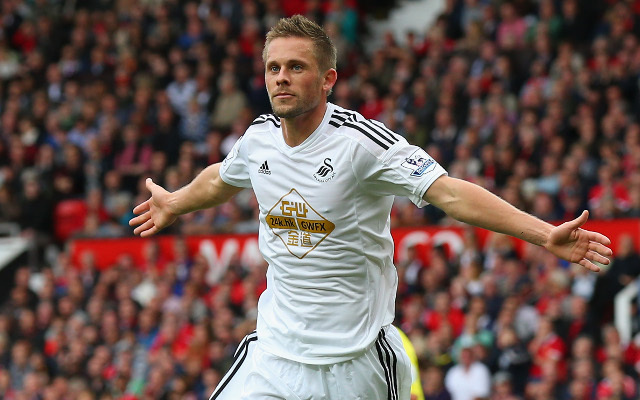 Yesterday we brought to Swansea’s star of the season in the form of Gylfi Sigurdsson. Despite his heroics, there have been few teammates who have failed to pull their weight this season and ultimately, underperformed by some distance. For the Player of the Year we could have presented you with Sigurdsson, Fernando Llorente or Alfie Mason, but far the underperformer of the year, there are far too many candidates. However, we believe no-one has underwhelmed quite as much as Borja Baston. 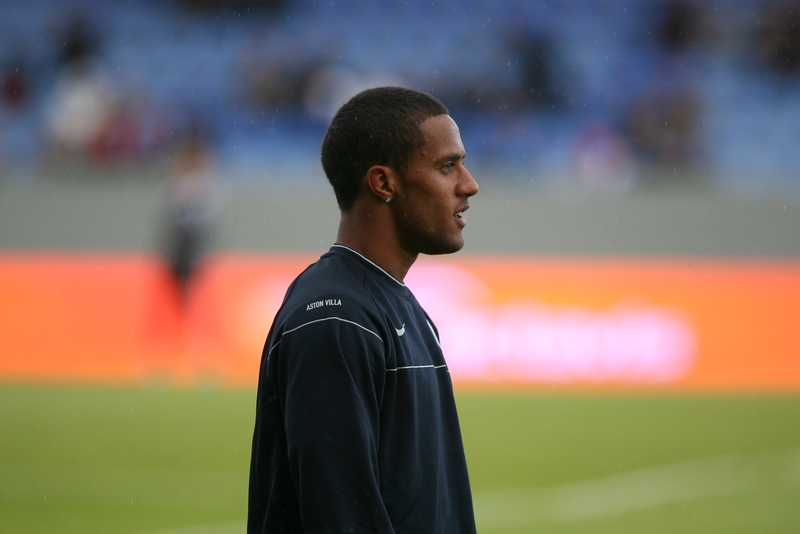 Arriving from Atletico Madrid for a club record fee of £15.5million, there was a buzz around the Swans and the Liberty faithful were excited to see the striker in action. But Baston has far from enjoyed life in the Premier League thus far and it’s unsurprising to see him linked with a move away. For Eibar last season, the 24-year-old bagged an impressive 18 goals in 36 league games, equating to one goal every two games. And at Zaragoza the previous season, he boasted an even better record with 23 goals in 38 league games, starting every game for the Aragon club. But arriving in Wales, Baston failed to hit the ground running and has started just four league games for Swansea, costing the Swans over £3million per start. The Spaniard does have a further 14 appearances off the bench but has managed just one goal for the club, in a 3-2 defeat at Arsenal. Baston played little to no part in Swansea’s top-flight survival surge and we may well have seen the last of him at the Liberty. He did not feature in either of the club’s last two games and has not started for the club since the 7th of January in a 2-0 defeat to Hull. After failing to make an impact, the striker was hauled off on the hour mark and that pretty much sums up his debut season in the Premier League. For all the excitement surrounding the transfer, particularly in regards to that hefty fee, it’s disappointing to see Baston’s move turn out how it has, though Paul Clement may throw the forward a lifeline. The Swansea boss said: “He hasn't had the kind of year he or we would have liked for various reasons - but that doesn't mean he doesn't have a future here. "We have to all talk about that and decide what we're going to do for the best of him and the best of the club moving forward." However, there is no brushing over his failings and Jason Levien who bought a controlling stake in the club in the same window Baston arrived stated that the club “certainly we had higher expectations” for the player. Should Baston depart, it’s likely that a move back to La Liga awaits, he is clearly prove in that league and suited to the style of play whereas the Premier League requires a lot more physicality. Though, if he does choose to stick around, he has his work cut out to prove himself. 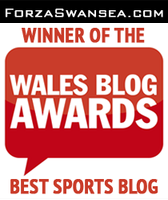 Swansea’s late fightback against West Brom yesterday was the perfect curtain call on what has ultimately been a great end of the season. Whilst the Swans should be far from content with their showing this year, they can be proud of the resilience they have showed since the arrival of Paul Clement and whilst another relegation isn’t acceptable next year, we guess we’ll let them celebrate, for now. Though, one player who has been able to hold his head throughout the campaign is Gylfi Sigurdsson. The midfielder is unsurprisingly being linked with a £25million return to Tottenham after a marvelous season, boasting nine goals and 13 assists. That means that the Icelandic man has been directly involved in 22 of Swansea’s 45 league goals this season, just short of half. As well the goal difference of Paul Clement’s side being drastically worse off, the Swans would also be 14 points worse off were it not for Sigurdsson’s influence. This would see them in 19th place with just 27 points as opposed to 41. For his efforts this season, Sigurdsson has scooped four Man of the Match awards and unsurprisingly, the Swansea Player of the Year Award. Clement seems hell-bent on keeping the midfielder but his head may be turned by a return to Spurs under Mauricio Pochettino. The Argentinian is also said to be tracking Ross Barkley and whilst he does remain keen on the Everton man, he knows it would set his transfer budget back some £50million and he’d be able to acquire Sigurdsson for half of that price. It is believed that Pochettino was perturbed by Sigurdsson’s sale and thought he should have never been allowed to leave White Hart Lane. The midfielder did of course switch London for Swansea in 2014 and Pochettino had little time to exert his influence. In December Pochettino described the decision as a mistake and claimed that the midfielder would have been “perfect” for Spurs. With the likes of Eric Dier and Dele Alli been linked with moves away from Spurs, the club may just need to accumulate some new bodies in midfield and Sigurdsson would be the perfect addition. 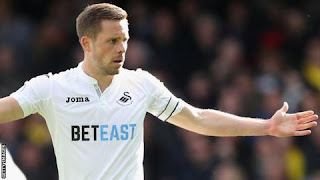 It would be a huge loss for Swansea if Sigurdsson was to leave and may cause other players to head for the exit door, though should they manage to retain his services, they may just go onto enjoy a quiet season of mid-table mediocracy next season, a breath of fresh air following their recent brush with relegation. In addition to helping his teammates stay at the Liberty, if Sigurdsson is stick to around, his presence may just help convince Clement’s transfer targets to head to Wales. He is an undeniable talent and without him, Swansea would undoubtedly be down and out. 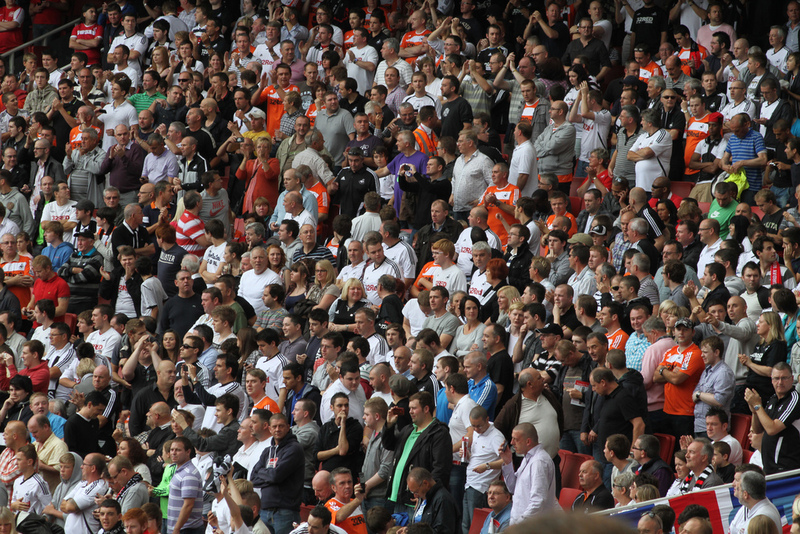 There’s likely to be something of a party happening at the Liberty Stadium on Sunday. Swansea secured their Premier League status last week with their 2-0 over Sunderland, followed by Hull’s 4-0 drubbing away to Crystal Palace enough to see them safe. The travelling Swansea fans were sent into raptures upon the final whistle at the Stadium of Light and it’s unlikely they’ll care too much about Sunday’s result against West Brom. It’s probable that Clement, who has won eight of his 18 league games this season, will offer the same side that beat Sunderland as there no new injury concerns for the Swans. Borja Baston, who may just play his final game for the Swans should he feature, faces a late fitness test whilst Wayne Routledge may be named on the bench after returning from a hernia problem. Baston has been a huge disappointment at the club following his £15.5million transfer from Spanish giants Atletico Madrid. The Swans head into the game in good stead and are unbeaten in four league matches, taking ten points from a possible 12, scoring six and conceding one during this run. Clement’s men have also lost just one of their last seven league games, drawing one and winning five. 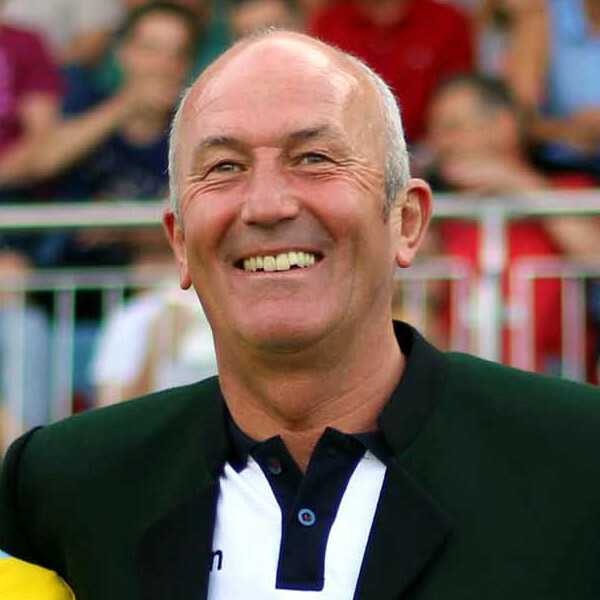 West Brom on the other hand, are without a win since March and have not won on the road for eight games. It’s fair to say it’s looking like advantage Swansea. The hots have won four of their five home top-flight home games against West Brom, scoring three goals on three separate occasions. Tony Pulis will hope his side can keep the in form Fernando Llorente quiet, the striker has netted nine goals in his last ten league appearances at the Liberty and scored against Sunderland at the weekend. Elsewhere, should Gylfi Sigurdsson score, he will be the first ever Swansea player to chalk double figures for both goals and assists in a Premier League campaign. Swansea saw cemented their status in the Premier League this weekend. Paul Clement’s men did their job by seeing off a lacklustre Sunderland side 2-0 away home from and were duly rewarded with safety as Crystal Palace thrashed Hull 4-0 to condemn the Tigers to the Championship. It was a spirited display from the Swans but even by Sunderland’s standards this season, their display was poor. Still, nothing can be taken away from Clement and his side, the former Derby County manager has done a remarkable job in turning around their fortunes and deserves some credit. Swansea wanted it more than Sunderland, chased every loose ball, every pass, every cross, the fight they put up at the Stadium of Light was truly commendable. 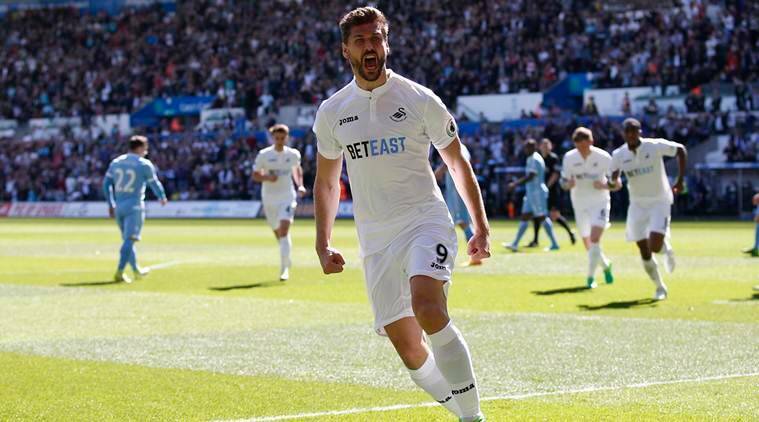 Fernando Llorente opened the scoring inside ten minutes, heading home Gylfi Sigurdsson’s free-kick to score his 14th of the season whilst making it Sigurdsson’s 13th assist. The Spaniard has been crucial to his side’s survival, particularly their current four game unbeaten run in which has scored in all three of Swansea’s victories. The link-up play between the striker and midfielder called the Wearsiders problems all afternoon, though David Moyes men did not look too keen to do something about it and Swansea continued to dominate. The visitors’ efforts were rewarded on the stroke of half-time as Kyle Naughton wrapped up the victory with a superb goal. The full-back piled a brilliant angled drive into the far top scorer past a hapless Jordan Pickford to worsen the Black Cats’ misery. The goal sent the brilliant travelling support into raptures as this spurred their team to the finish line, knowing another season in the top flight beckoned. What could have been a nervy encounter proved to be a stroll in the park for Swansea and now all eyes were on Crystal Palace v Hull. Following Hull’s disappointing defeat to Sunderland last weekend, a lash back from Marco Silva’s men may have been on the cards. Fortunately for Swansea and Big Sam, Hull delivered a performance that would make even Sunderland blush and Palace were allowed to run riot. Wilfried Zaha, Christian Benteke, Luka Milivojevic and Patrick van Aanholt each scored in the four goal rout to secure both theirs and Swansea’s Premier League status. Whilst it’s by no means the greatest of escapes for Paul Clement and his men, it’s a hell of an achievement. The Swansea have had three managers this season and found themselves at the bottom of the table at the midway point of the season, boasting a mere 12 points. It’s a great turn around for Swansea and Clement can now look to the future and begin to build a squad that is ready to compete in the top flight. Swansea host Everton tomorrow in a crunch tie that will help decide the Swans’ Premier League fate. Paul Clement’s men currently reside in 18th place, two points adrift of safety and desperately need a win if they are going to survive. Everton will be a tough test with the Toffees flying high in 7th place. Clement will be buoyed by news that Fernando Llorente has recovered from a stomach bug in time, however, Jefferson Montero’s season looks to be over due to a niggling hamstring injury. The game comes too soon from Angel Rangel who will return to training next week after missing two months through injury. Everton will be looking to comeback from their 3-0 drubbing at home to leader’s Chelsea whilst Swansea will be keen to extend their unbeaten run to three games. Clement’s side picked up a respectable 1-1 draw at Old Trafford last week, off the back of a promising 2-0 home win over Stoke. If the hosts do go unbeaten, it will be the first time they have done so for three league games this season and if they win, it will be their first back-to-back home wins since May 2016. Undoubtedly, Swansea will be wary of Everton’s good form and should not be fooled by Ronald Koeman’s six away games without a win, though they should look to exploit the Toffees’ away day misery. Everton have never lost a league match away to the Swans, winning eight and drawing three of the last eleven fixtures and that is something Clement must change tomorrow as time is running out, and fast. Swansea are unbeaten in their last five games against the Toffees and if they wish to take that to six games, they must be at the top of their game defensively. They may not be bottom but Clement’s men hold the accolade for the worst defensive record in the league, conceding a total of 69. And with players like Romelu Lukaku and Ross Barkley headed to the Liberty, they can’t afford any mistakes as they could prove fatal. If the Swans are to get one over on Koeman’s side then it’s highly like Gylfi Sigurdsson will be involved, out of Swansea’s 20 league goals, the Icelandic man has been directly involved in 21 with creating 12 and scoring nine. In addition to this, the midfielder has seven assists from set-pieces, something which no other player in the league is close to matching. With Hull at home to Sunderland, it’s looking to be a certain three points for Marco Silva’s men thanks to their impeccable home form and Sunderland’s doomed fate. Clement and his side will know the outcome of that game before the kick-off against Everton and they must cope well under the added pressure. But if they manage to keep their form of the last few games up, they are more than in with a chance. 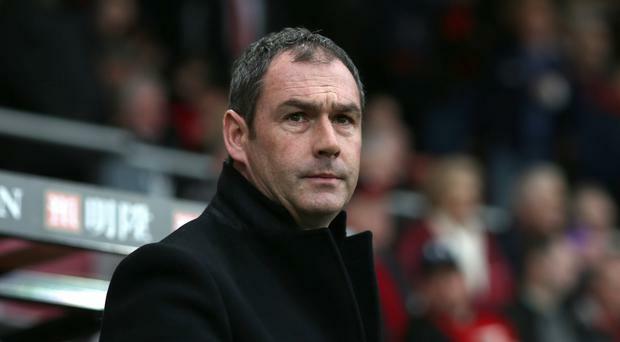 Reports from the Liberty Stadium today suggest that Paul Clement will remain as the club’s manager even if Swansea are condemned to the Premier League. Currently, the Swans reside in 18th on the league are two points adrift of safety and have just three games to save their top flight status. Clement’s men host Everton at the weekend and head into the game with two respectable performances behind them, following a hard fought 1-1 draw at Old Trafford and a 2-0 home win over Stoke. Clement arrived at the club at the turn of the year with Claude Makelele joining him as assistant, with experience at Real Madrid and PSG on their CVs. The ex-Derby man recorded his first win as Swansea manager with a 3-2 victory over Jurgen Klopp’s Liverpool at Anfield. Following a successful first month in charge, Clement received an accolade for the Premier League Manager of the Month. Although the Swans remain in 18th place, 45-year-old undoubtedly has them playing better football. The Premier League table, if started in January, would see Clement’s side in an respectable 11th place whilst fellow stragglers Sunderland and Middlesbrough would still be cemented to the foot of the table. During his 16-game tenure at the Liberty, Clement boasts six wins, two draws and eight losses, compared to 13 losses, three draws and just three wins under Francesco Guidolin and Bob Bradley, both of whom were dismissed. Chairman Huw Jenkins and American owners are keen to bring stability to the club with the Swans having had three managers in charge this season. Jason Levien and Steve Kaplan visited South Wales last month and held discussions with Clement regarding the club’s long term future, a future they want to be part of. The owners are said to be impressive with the way the former Madrid coach has developed talent at the Liberty and changed the team’s style of play. If Swansea do take the plunge, there is no doubt that Clement can do a job in the Championship judging by his spell at Derby. Despite the fact Clement lost just one game in 19 from September to December, Clement was given his marching orders having won just one game in seven. He left Pride Park with a record of 14 wins, 12 draws and just seven losses accumulating to a win record of 42.4%. If afforded the funds, Clement is capable of constructing a strong squad that can fight to get back to the top as soon as possible. And if the Swans do survive the drop, he is able to rebuild in the summer to ensure this season’s relegation battle is the club’s last.